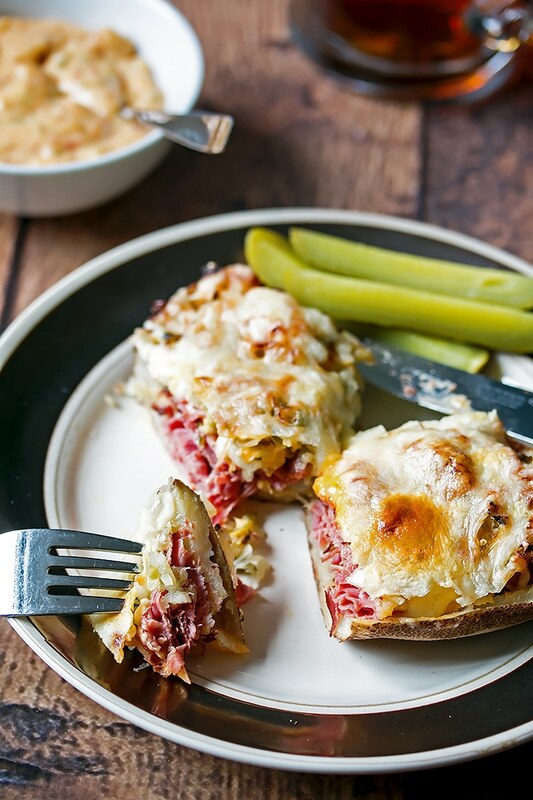 These reuben stuffed potato skins are full to the brim of smoked meat, sauerkraut, a sweet and spicy sauce and bubbling Swiss cheese. Debbie LOVES a good reuben sandwich. All that thin sliced meat covered in melted cheese and tangy sauerkraut. 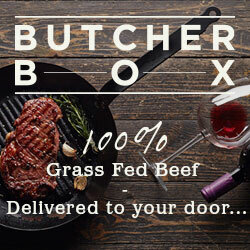 Its SO good and we often share one when we go out for lunch and there’s one on the menu. 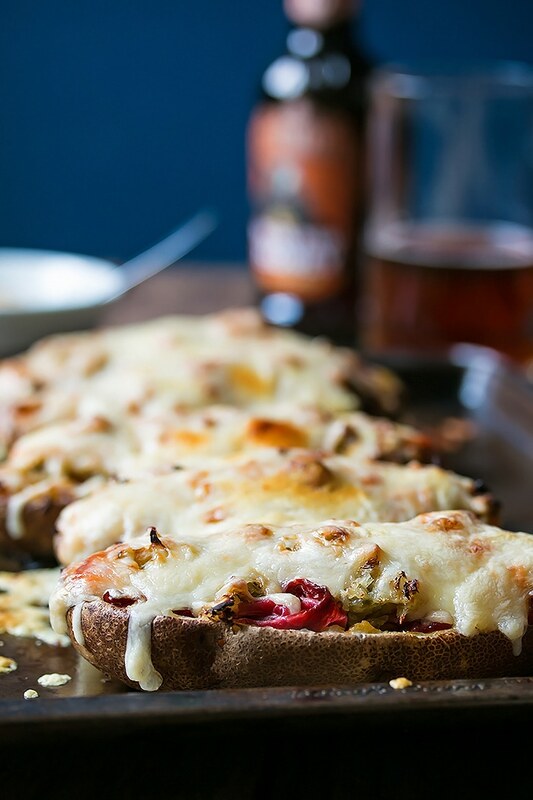 Since we love the flavors of the Reuben and we love potato skins, we figured we would try mashing these two loves together in reuben stuffed potato skins. That is a lot of “loves”. We just love food. You know this about us by now. 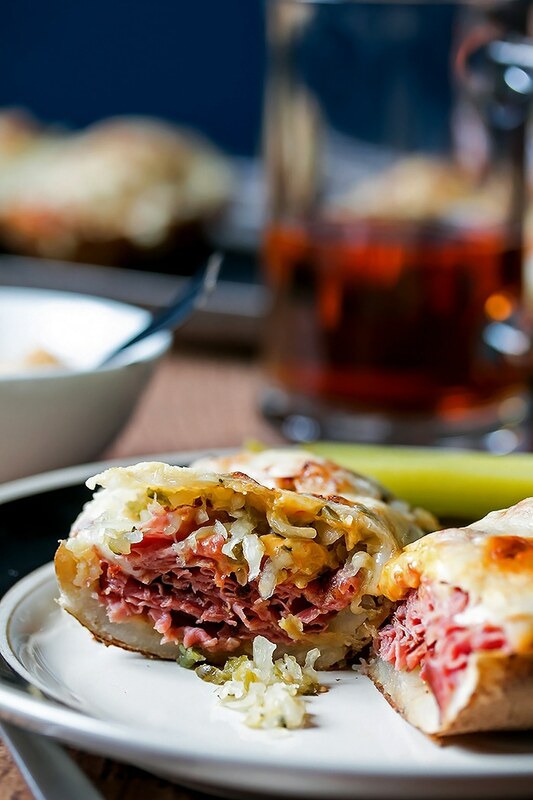 These stuffed potato skins would be a great dish to serve on your next game day menu. They are light enough, if you just have one or if you cut them in half, to serve as an appetizer, but you could also serve them as sort of a main. They will help fill up a crowd of hungry game watching guests and my guess is that many people won’t have tried this twist and that will make you the star as soon as they take their first bite. 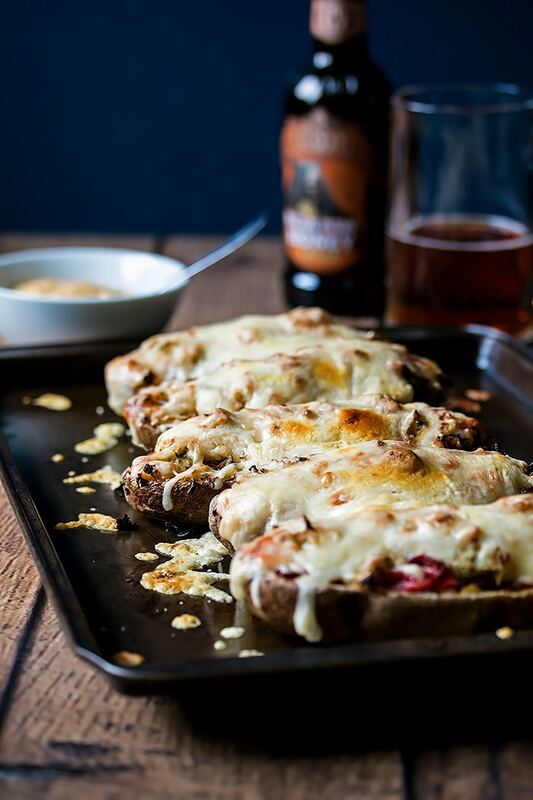 For our stuffed potato skins, we used a sauerkraut that I made, but you could easily just buy one from the store. Only, if you do, make sure to buy the one that’s in the cooler rather than one that’s on the shelf. The ones on the shelf have been treated with heat and there are no beneficial bacteria left in that sauerkraut. However, the ones in the cooler likely have live cultures (look for those) and are extremely good for you and in my opinion, they taste better to. If you want to make your own sauerkraut, its super easy, but you have to start a least 4 or 5 days before you want to use it. Here are a couple links to basic recipes for sauerkraut from Nourished Kitchen and The Kitchn. I like to make mine using the same method, but with tomatillos, onion, and a little jalapeno. Totally delish! You could even throw some pickles in there if you felt like it. Or make mini potato versions (fun!). Use Swiss cheese or Gruyere or, even better, a mix of Emmental and Gruyere. First make the sauce. Add all the ingredients to a bowl and mix well. Cover and set in the fridge until you are ready to use it. Next get the potatoes ready. Heat your oven to 375 degrees. Prick each potato and wrap in foil or place in a big roaster with a lid. Bake for 45 - 60 mins or until the potatoes are fully cooked. Let them cool. 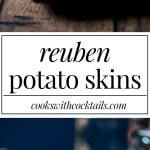 When they are cool enough, cut them open and scoop out the flesh leaving behind a little bit of potato on the skins. Stuff the potato skins. Heat your oven to 375 degrees. Spread a tbsp or two of the sauce on the bottom of each potato skin. On top of the sauce, layer the slices of meat and a good dollop of sauerkraut and the top that with a good handful of cheese. Place on a parchment lined baking tray or in a casserole pan and bake until cheese has melted. About 5 - 10 mins.